We are huge fans of metallic tones in wedding styling around here, especially gold! But when it comes to using gold in your wedding styling, it can really go two ways. We speak with a lot of brides who LOVE the idea of using gold in their wedding, but are unsure of how to achieve this tastefully (without it being tacky!). There can definitely be a fine line between elegant and overwhelming when it comes to this metallic shade, but when done correctly - you've got yourself a showstopper of a wedding. Over the last few months, we have seen some AMAZING weddings being created with gold accents throughout. From furniture and decor right through to your stationery - there are endless ways to include this statement shade tastefully into your big day. If you've decided that you definitely want gold to be a feature of your wedding but you don't want to go overkill with it, then create a cohesive flow from your ceremony right through to your reception. This will tie the styling together in a more subtle, natural way. Think about how you can incorporate pops of gold at each area of your wedding to link it through. It might be something like a welcome sign written in gold calligraphy for your ceremony, followed by some beautiful gold stools or a gold detailed bar in your cocktail hour, and then gold cutlery on your reception tablescape. 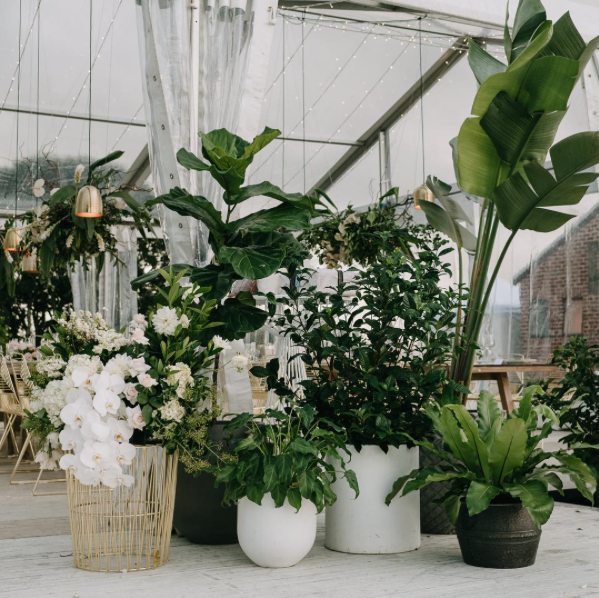 Another easy way to do this is through the elements that are going to feature throughout the entire wedding anyway - like your stationery, or the vases for your floral arrangements. Here's where gold can start to feel a little tacky: trying to include the shade in as many different ways as possible without simply focusing on what will make the biggest impact. Instead of focusing on a million different styling elements, stop and think about how you can invest in key pieces strategically to save you in other areas. Two examples that come to mind are dining chairs and cutlery. Both of these items are non-negotiables for a sit down reception that you'll need to organise anyway, so investing in these elements to bring in your gold accents is an easy and effective solution. Imagine a beautiful gold dining chair setting the tone for the entire reception. You could then keep the tablescape minimal because the chairs have made the impact for you already. The same rule applies with gold cutlery - these statement pieces will help create a beautiful tablescape all on their own with minimal styling required elsewhere. Keep in mind that gold can come in many different shades. You've got champagne gold, yellow gold, rose gold... so the tip here is to pick a shade and stick to it. Too many different shades of gold competing for attention can really throw out the styling, particularly for elements that are going to be seen close together like your table settings. Champagne gold is generally the most neutral option, so if you want to play it safe then keep an eye out for pieces in this shade. And the list goes on!! Think about the vibe you want to achieve with the look and feel of your wedding, choose a colour palette to suit and then use your gold accents to take it to the next level. Still stuck for ideas? Get in touch with our friendly hire team who can help bring the perfect furniture plan together for your big day!